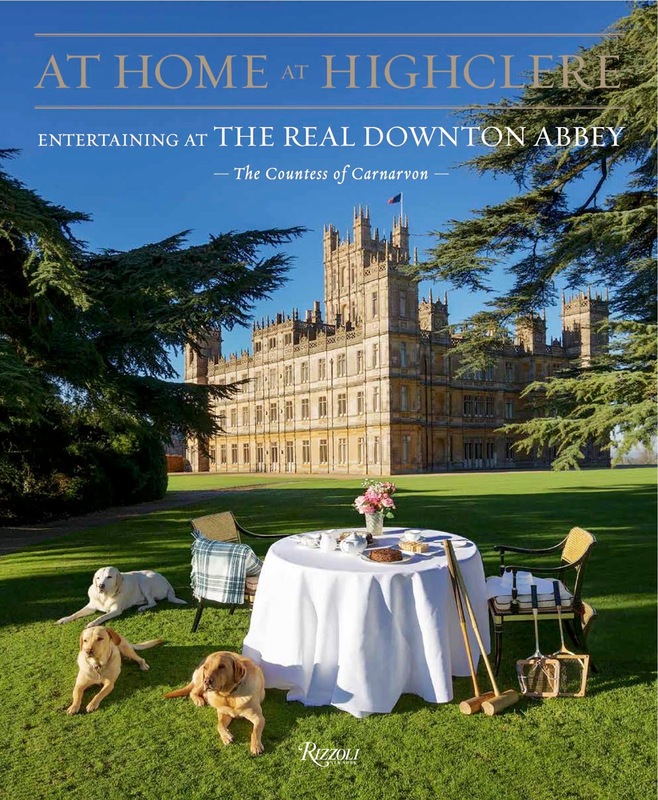 ‘At Home at Highclere’ by the Countess of Carnavon, newly published by Rizzoli, is an exciting new book for ‘Downton Abbey’ fans. 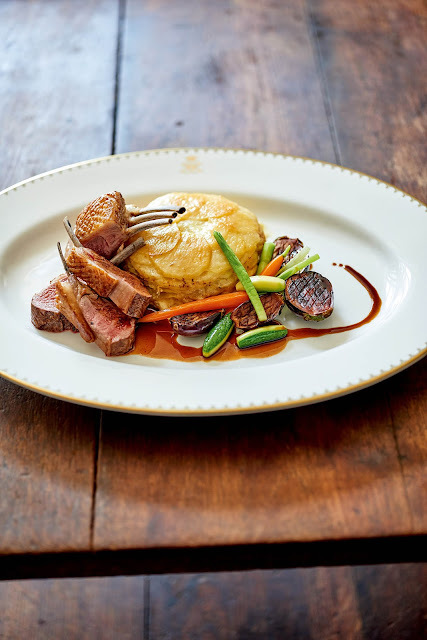 It focuses on entertaining as well as history, recipes, architecture, and behind the scenes at the 'real' Downton Abbey. If like me you have been obsessed with the fictional ‘abbey’ interiors shown in great detail in the show over the last few years, you will love this insider look at the grand and historic castle where the show is filmed. 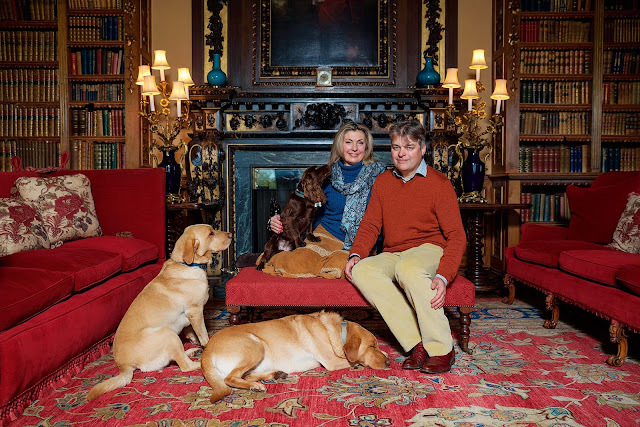 The Carnavons at home at Highclere. The library will be very familiar to ‘Downton’ fans. It has been the scene of so many dramatic moments in the series. In fourteen beautifully illustrated chapters, the book invites readers to breakfast, dinner, lunch, cocktails, and a wonderful taste of afternoon tea, along with traditional English fish and shellfish dishes, cakes, puddings, and regional and seasonal vegetables soups and savouries. 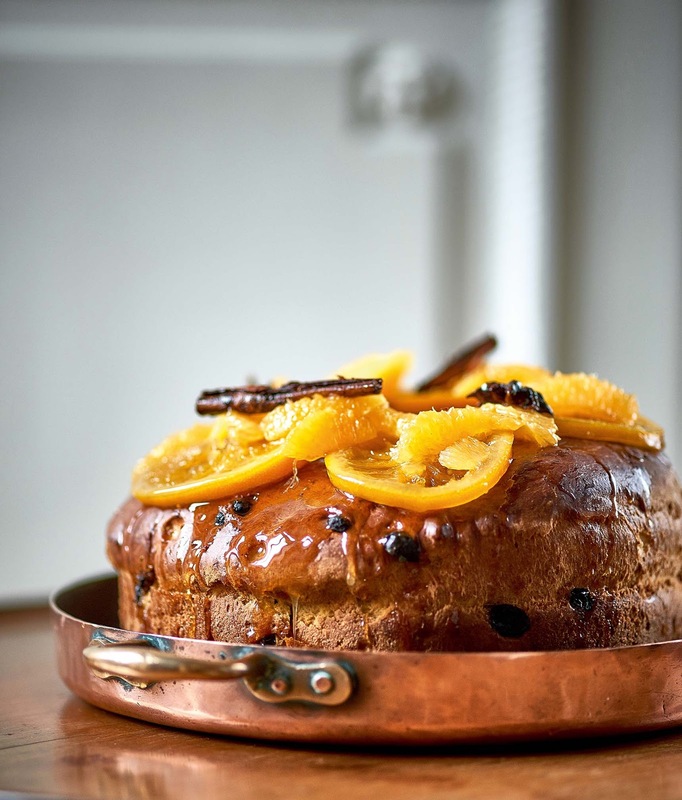 Best of all, there are recipes for those who also want to cook and dine, a la Highclere. The book is also detailed with the history, architecture, interiors, scandals, royal visits, families, décor, music, famous guests and everything an Anglophile could desire. And the book will be perfect reading as we all wait for the ‘Downton Abbey’ movie, which is now in production. 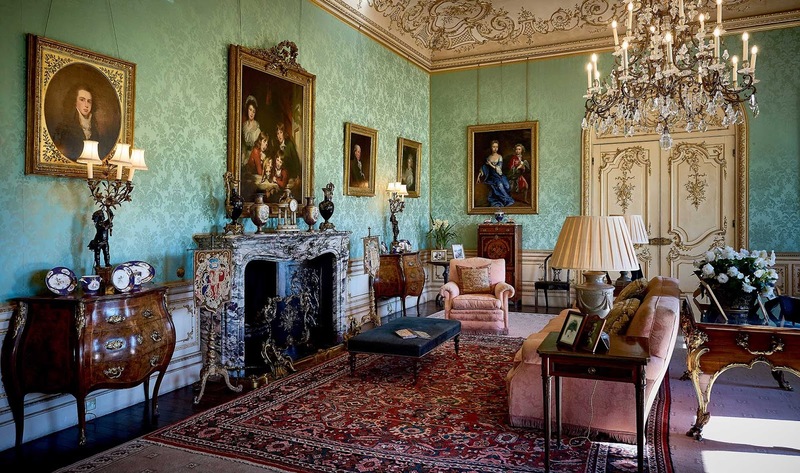 Seventeenth-century Highclere Castle, in the Jacobean/ Elizabethan style, is now, thanks to millions of viewers of ‘Downton Abbey’, one of the most famous historic houses in the world. The 5,000-acre estate is located in Hampshire, England, about 5 miles south of Newbury, Berkshire. 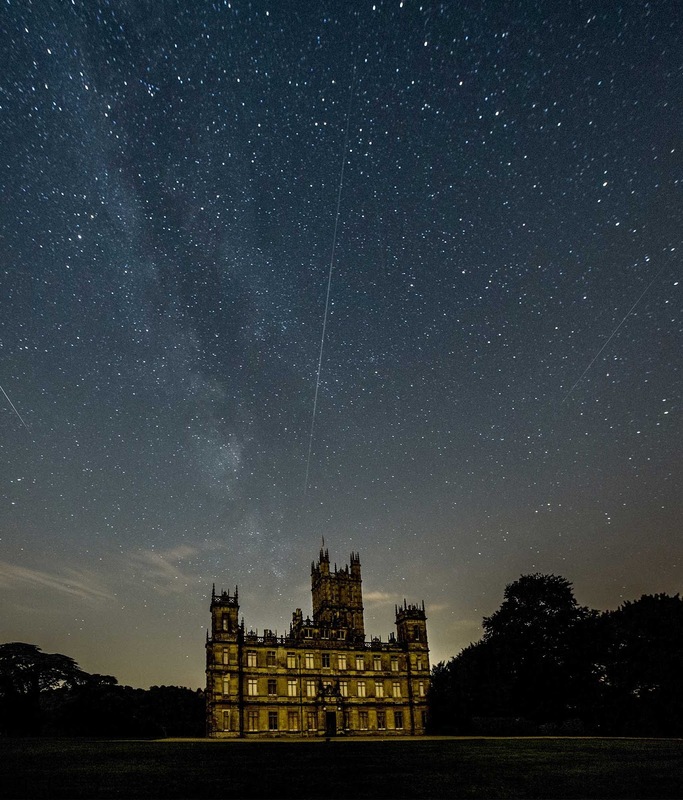 Throughout the centuries, Highclere has welcomed royalty, statesmen, Egyptologists, ancestors, and pioneers of technology along with men and women from the worlds of music, literature, art and letters. There have been fascinating guests upstairs, and cooks and housekeepers downstairs keeping everything running smoothly. Chapters of this book detail the library and the writers who visited, along with a chat with the gamekeeper, a visit from the Prince of Wales, dining traditions, even the long tradition of keeping bees. The etiquette of the invitation, the balance of guests at a weekend house party, their placement at dinners, and the entertainment of friends, as well as the domestic management required to execute the perfect occasion, have all preoccupied successive generations of châtelaines. Readers learn all of the lore, the rules, the subtle cues, and the country style. 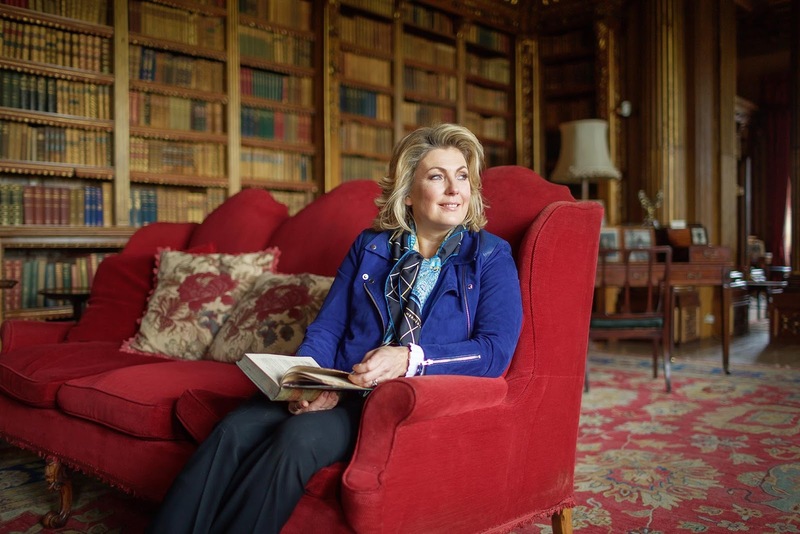 In ‘At Home at Highclere: Entertaining at the Real Downton Abbey’ Lady Fiona Carnavon, the 8th Countess of Carnarvon, entices readers to enjoy five real weekends at Highclere, mid-19th century to the present day. 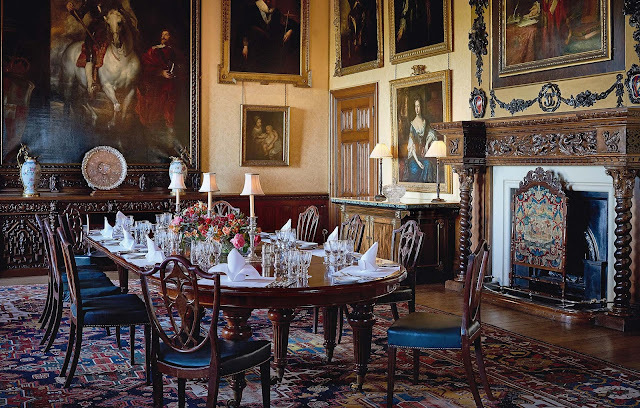 Benjamin Disraeli’s reform cabinet in 1866, a literary weekend with Henry James in 1886, a visit from the Prince of Wales in 1895, a musical Easter with Malcolm Sargent in1935 and the vivid and outdoorsy life in the weekend of Highclere today. Lady Carnarvon tells the stories of the great and the good, the art of hosting through the ages, and, most critically, the delicious recipes to suit every occasion and guest, from the crowd- pleasing Highclere Loin of Venison for a weekend treat or Summer Pudding, a favorite of Lord Carnarvon and his cricket team. At Home At Highclere is a richly detailed compendium of historical reports, vivid stories and delicious recipes from a stately residence that is not just a castle but also a home. No surprise, in the 300 pages, the author takes readers ‘downstairs’ to meet housekeepers and cooks and staff with specialized talents for taking care of antiques and art. The Countess of Carnarvon in the library. Photo copyright Adam Hillier Photography. Fiona, 8th Countess of Carnarvon, is the wife of Geordie, 8th Earl of Carnarvon. She is an alumna of St Andrews University, a former auditor for Coopers & Lybrand accountants and she created her own clothes brand in the 1990s. She and her husband and son live ‘quietly’ with seven dogs, many beloved horses, a brood of chickens, a pet rabbit and a sheep, as well as a number of beehives. Together, they manage a range of businesses at Highflier Castle, home of the television drama Downtown Abbey. And they host the actors and production staff when ‘Downtown’ is being film in the castle, in the grounds, and all over the estate. Fascinated by the history of the people as well as the Castle at Highclere, Lady Carnarvon has written two New York Times bestsellers: Lady Almina and the Real Downton Abbey: The Lost Legacy of Highclere (2011) and Lady Catherine and the Real Downton Abbey (2013). Seven dogs, many horses, a rabbit a sheep and chickens...my kind of place! I can do without the bees... Coming from Rizzoli I bet it's a beautiful book. I have to say the Carnarvons have very wisely monetized Highclere without overdoing it (to date). The series was so good I hope they don't spoil it with a movie. I still watch old episodes once in a while, especially on rainy Sunday afternoon. It's like Casablanca or An Affair to Remember, you can always watch it one more time. Your comment is appreciated and wonderful. Yes...we have watched Downton since the beginning...before anyone had heard to it. I First saw it in London, somewhat by chance, in my hotel. In UK it is on a commercial station...so every fifteen minutes there is a break to advertise tea or fish sticks or insurance or a bank or something that has nothing to do with Downton style! Here is it more civilized...PBS, non commercial. FIONA the Duchess...is very lovely an unaffected and low-key and so is the Eartl of Carnavon...it was one of his ancestors who made discoveries in Egypt that were momentous...so he has a lot to live up to. They are country folk...and keep every possible tradition. 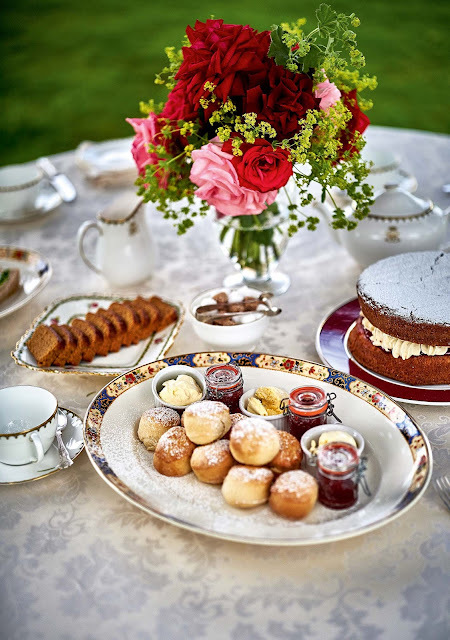 Their cuisine is a more modern country/fine English style...lighter and less 'cooked' and more vegetables and more green things...and lighter sweets. I don't cook as you know...but the recipes looked quite straightforward. Certainly the pix of the dishes are lovely and unfussy. I hope you like the book...there is a whole season of reading . I left you a message on FB as well. Thank you for re-posting my 'Journey around my Library'. I was fun for me to see all of my favorite books. And I must tell you--this selection on my list is extremely edited and curated. I review and check many books and among them find the jewels and the gems and the treasures. New Fun Reads — Global Style with Wit!